Gutters Unlimited creates in-house custom made concrete splash blocks, roughly 8.5” x 17.5” in size. No installation is needed, simply place the splash block underneath your downspout or ask your gutter company to include them during installation. 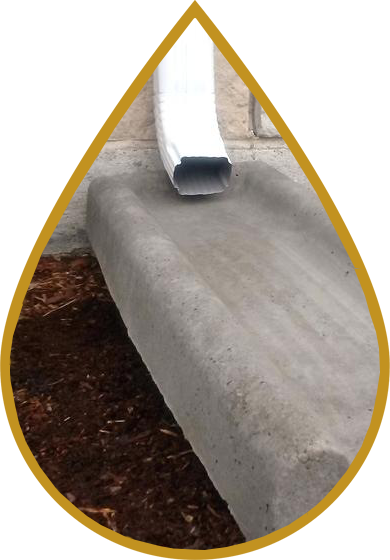 Our splash blocks are designed to direct water from the bottom of the downspout where the water exits and expel the water further away from the home. This action prevents corrosion and further protect the foundation of your property. These concrete splash blocks are available for sale at our warehouse in Melbourne, FL. Pricing starts at $15 per block and discounted pricing is available in bulk quantity (pre-orders only). Please note: our warehouse hours are from 8:00 am until 3:00 pm Monday thru Friday. Bulk orders are available by appointment only.